When a concert at Portland venue Wonder Ballroom manages to sell out weeks in advance of the show, it can only mean one thing: the most zeitgeisty of artists must be coming to town. And sure enough, when it was announced that James Blake would be making his second appearance in as many years at the magnificent east side venue, tickets went quicker than expected. If nothing else, it proves that James Blake’s new album was a success. Opening the night was New York producer Drew Lustman, aka FaltyDL, a sneaky talented guy who has been putting out impressive records and remixes for years. Without a proper breakout single, however, Lustman lacks the kind of punch that it often requires to get the crowd moving early in the night. But the weather was beautiful, the air was breezy, and Lustman’s set provided the ultimate spark for a terrific night of music. Technically sound and perfectly paced, Lustman blasted out his own material mixed with recognizable samples (Public Enemy), and transformed a room full of glossy-eyed, tank-topped boys into a sweaty mess of dancing shoes. 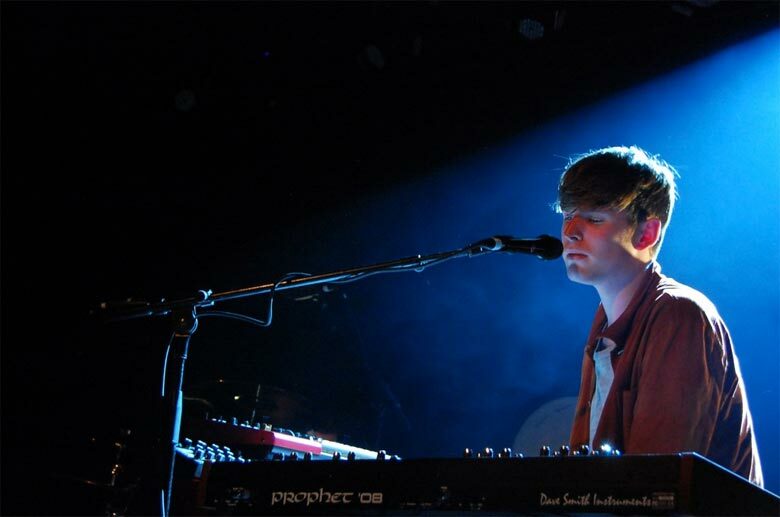 By the time UK import James Blake finally took the stage on Wednesday night, the anticipation had reached fever pitch. People clamoring about his instruments, a plethora of keyboards and microphones positioned stage right; there’s no doubt that every member of the audience was familiar with Blake’s infamous vocals. In beginning this hour-and-a-half-long set with a few impromptu beats, Blake caught the crowd off-guard. But it wasn’t long before he was blasting out tracks from his debut album like “I Never Learnt To Share” and an extended “Why Don’t You Call Me.” And while the set began with a rather somber tone, backdropped by three enormous brass rings outfitted with a kind of leather pulled taught and illuminated with three soft lights, the mood under the A-frame roof was soon uplifted. With the sound of one simple sample — and those who have followed Blake’s career since a bedroom producer of dubstep already know which one I mean — the crowd absolutely exploded. “CMYK” remains the definitive song in Blake’s collection in terms of fan appreciation and reaction. And while it’s essentially like Blake playing DJ on stage versus attempting to recreate the infectious jam, it certainly doesn’t detract from just how massive the song has become. But as Blake finally settled into his material from Overgrown, it was apparent just confident he has become. On past tours, he so often appeared to be hiding behind his keyboards; now he was affable between songs and upright in his chair, belting out vocals that are cavernous in their explosiveness. No longer does it seem like Blake is propelled by the energy of the internet and thirstiness of the media to crown him the next king of this or that. Instead, Blake is embracing his unparalleled ear for a tune and stunning vocal skill, enrapturing a crowd that was ready to embrace the youngster. From there, it mostly carried on how you would expect. “Retrograde”, my personal favorite from Overgrown, made an appearance during the set alongside “Life Round Here” and “Digital Lion”. Unlike so many hyped producers and artists who have come through this town in recent years, James Blake doesn’t appear ready to falter. Brought to life, Overgrown is even more powerful than it is on record. With the press of each key, the crash of each cymbal, and the strum of each guitar chord, it was obvious that Blake will only continue to grow in his relatively young career. The longing on each fan’s face after Blake finally left the stage was reason enough to believe this to be true.